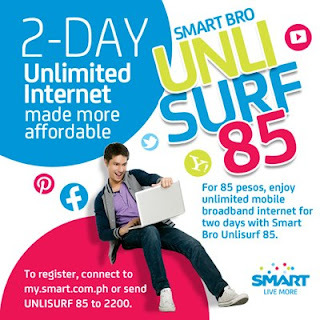 Home News Telecoms Smart Bro UnliSURF 85: Unlimited internet for 2 days is now made affordable! Smart just unveiled its most affordable unlimited broadband internet on prepaid with the new Smart Bro UnliSURF 85. From 100 pesos down to only 85 pesos you get not one, but two days of unlimited mobile broadband internet. To register to Smart Bro UnliSURF 85, just text UNLISURF 85 to 2200 from your SmartBroaccount or avail via My Smart Account. More details after the jump. Want to maximize Internet fun all day and night? With Smart Bro UnliSURF 50, you’ll get to enjoy UNLIMITED surfing for 24 hours! Just text UNLISURF 50 to 2200 from your SmartBro account or avail via My Smart Account. You get not one, but two days of unlimited mobile broadband internet with the new Smart Bro UnliSURF85 from 100 pesos down to only 85 pesos! Just text UNLISURF 85 to 2200 from your SmartBroaccount or avail via My Smart Account. Enjoy FIVE full days of UNLIMITED surfing plus unbeatable savings with Smart Bro UnliSURF 200! Just text UNLISURF 200 to 2200 from your SmartBro account or avail via My Smart Account. Globe Telecom has unlimited broadband internet for 1 day (P50), 3 days (P120), 5 days (P200), and 30 days (P999). While the cheapest unlimited broadband internet goes to Sun Cellular with their 3 days (P100) and 7 days (P250) unlimited mobile internet. pls bakit hindi gumana ang UNLISURF 85 SEND 2200.. Pls yung tama kasi maubos load namin.. thanks..
good promo.. but i think mas dapat unahin ng smart kung papanu ma solve ang speed ng kanilang internet connection.. like fixing the congested connection and bringing more reliable and fast connection..